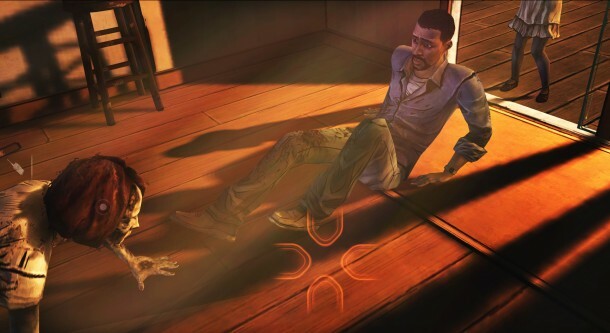 Whilst other adventure games attempt to include as much story-driven mechanics as possible into their puzzles, conversations, or use of inventory, The Walking Dead throws all these ideals out the window and focuses on one thing, the experience. And it is the experience in The Walking Dead that makes this game so unique. That’s not to say that this game doesn’t have it’s fare share of comedy (or more like sarcasm) and adventure, but it is the mechanics that truly shave the game down to it’s bare basics in order to allow the player to do the rest with their own imagination. Many a time, it is the freedom of the player that tends to manipulate the best scream or cry in this game. The inventory is not used in the established sense – that being item combining and the standard ‘examine’, ‘use’ and ‘talk to’ mechanics – but rather aids the player in connecting with other characters and improving one’s chances of surviving in this horror genre. There are notable times when the player can offer supplies or items to other NPCs in order to help them, and this can prove wise as these characters can become very valuable when wanting to pay back the favour in the future. What’s more, players can choose in most cases who they wish to help and who they don’t. Ultimately, the inventory is there at the player’s disposal to literally shape the game at their own will and use it as they like, given certain circumstances. There are usually only very few items in the inventory at one time, meaning that resources are low (as is true to a survival game), but also that items are not the core focus of the quests. There isn’t much complication in the UI of this game, and barely a heads-up display, but what is most important are the markers – appearing as white dots – on the screen to show components the player can interact with for gameplay. This reinforces the freedom of the player as in the inventory; given the circumstance, players can interact with objects they want to and ignore others. What they wish to interact with determines the unfolding of the game’s events, and given that this game allows for death and respawn – something very unorthodox for an adventure game – some markers NEED to be interacted with under certain timing. Timing with these markers are crucial because, well, it’s a zombie game. Unfortunately, players do not take dying seriously as they progress into the game, because there seems to be little penalty after dying multiple times. The main cut-scenes allow players to respond in conversation with a choice of four statements, and depending on what the player chooses will result in particular consequences. The designers and story writers have really given thought to how choices can immerse the player, and players truly feel a sense of worth and involvement in the outcome of events unfolding throughout the story as a result. This is also true for the branching narratives when the player encounters other characters whilst exploring. Thus, it is not a surprise that this game can end in multiple ways, depending on the player’s behavior and choices.